Arnold Houbraken (1660-1719) was born in Dordrecht and trained there by Willem van Drillenburg (ca. 1625-after 1677), Jacobus Levecq (1634-1675) and Samuel van Hoogstraten (1627-1678). In 1678, he entered the Dordrecht Guild of St Luke but moved to Amsterdam in 1709/10.He was a prolific draughtsman who supplied many designs and etchings for book illustrations and a number of his drawings were engraved by his contemporaries. He also specialised in elegant small scale history paintings and portraits all'antica, a series of which represents illustrious men for an English commissioner. Houbraken wrote the Groote Schouburgh der Nederlantsche konstshilders en schilderessen (Great Theatre of Netherlandish Painters and Paintresses) in 1721-23, which consists in a series of biographies of Dutch artists from the early 16th centuries and general treatises about art. Among his pupils were his son, Jacobus (1698-1780) Mathys Balen (1684-1746), Adriaen van der Burgh (1693-1733), Johan Graham (1706-1776) and Jacob Zeus (1686-1718). He was praised during his lifetime and up to the mid 18th century and was then rediscovered at the end of the 20th century. This painting is an exact copy of the signed panel Dido conducting Aeneas into Catharge by Arnold Houbraken, most likely depicted around 1700 and housed in the John and Mable Ringling Museum, Sarasota (SN273). They both have approximately the same dimensions and a larger third version on canvas had been sold at Sotheby's London, 12 Apr 1978, lot 132. 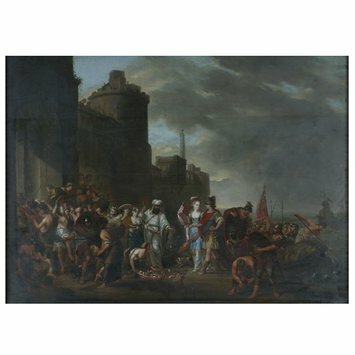 The original painting appears to have belonged to the Irish satirist William Norcott's collection, sold in 1811 in Dublin. During the 18th century, a large amount of Dutch works of art were shipped to England in order to supply the art market there. The copper medium of the V&A version and its high quality indicate it may be an early Dutch copy by an hitherto unidentified painter apart from his monogram WM. The painting illustrates an episode from Virgil's Aeneid which relates the birth of the Roman Republic, and more specifically the arrival in Carthage of the great Trojan hero Aeneas, son of Venus and Anchises, and founder of Rome. After many weeks on sea, Aeneas and his companions finally arrived in Libya near Carthage where the Queen Dido welcomed them. Aeneas and his companions brought many presents and this may result in the confusion depicted on the left half of the picture. 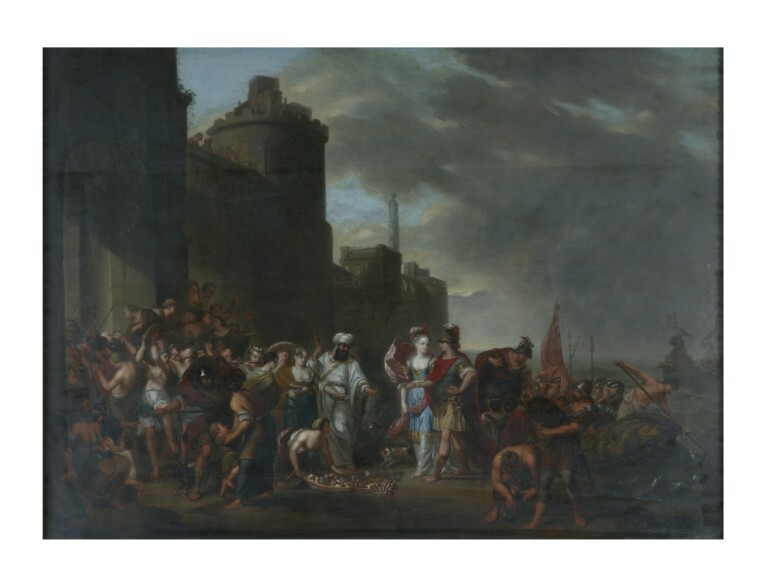 In the centre of the picture, before the gate of Carthage, Dido is conducting Aeneas into the city, around them are merchants and people welcoming the hero and his companions. Historical significance: This exact copy of Arnold Houbraken's Dido conduction Aeneas into Carthage, The John and Mable Ringling Museum of Art, Sarasota, illustrates well Arnold Houbraken's production of history painting in which he exhibits the classical grace of idealised figures, clear contours and delicate colours of late Dutch classicism. 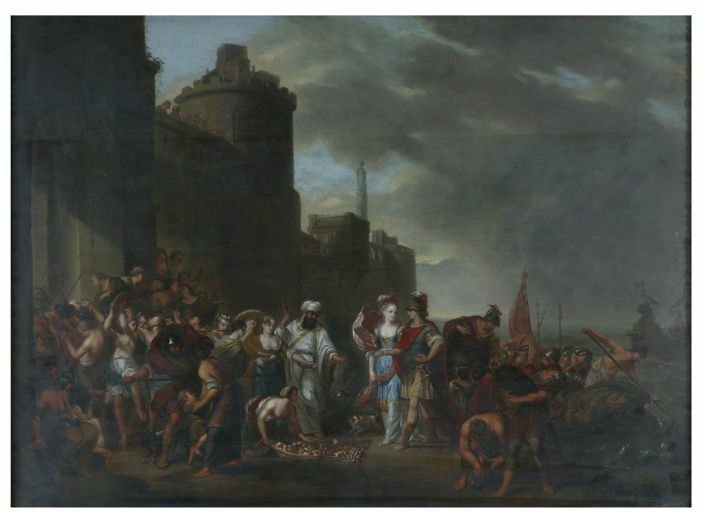 This painting representing an episode of Virgil's, Aeneid that relates the destiny of Aeneas, heir of Troy and founder of Rome, belongs to a large group of Republican Roman imagery highly appreciated in Amsterdam from the mid 17th century onwards. They were destined to both public and private markets, the newly constructed Amsterdam Town Hall providing the greatest number of public commissions and private patrons valuing these pictures for their being a model of great civic and personal virtue (virtutis exempla). In this subject matter, Aeneas' civic virtue lays in his forthcoming renouncement to Dido, who would fall in love with him, in order to fulfil his destiny and found Rome in Italy. Houbraken also depicted a version of the Death of Dido, resulting from the departure of Aeneas, recently acquired by the Dordrecht Museum. Houbraken specialised in small scale history painting such as the present one but also executed larger works: for instance, the ceiling panel Eros conducting Psyche into the Parnassus, also housed in the Dordrecht Museum. The largest group of republican Roman history pictures was produced in Amsterdam from approximately the middle to near the end of the 17th century when their number declined. History painting, i.e. depictions of non recurring events based on religious, classical, literary or allegorical sources, particularly developed in the second half of the 17th century in the Netherlands. Although, history painting began in the Netherlands in the late 15 and early 16th centuries with such artists as Hieronymus Bosch (1450-1516), Jan Mostaert (ca. 1475-1555) and Lucas van Leyden (1494-1533), it had long been overshadowed by the genre imagery. Dutch artists' new interest in naturalism transformed distant history paintings into contemporary scenes of everyday life, resulting in classical and biblical scenes that take place in Dutch settings with contemporary costumes along with the introduction in these pictures of historicised portraits, portraits histories. The first three generations of history painters in the Northern Netherlands were Roman Catholics who trained in Italy: religious history paintings, mythological themes and scenes from classical history occur indeed in the art of the late Dutch mannerists, the Utrecht caravaggists, the Pre-Rembrandtists, Rembrandt, who appears to be first and foremost a history painter, and his followers. Under the influence of the French Academy of Sculture and Painting and the international classicism, Dutch artists increasingly adopted a restrained controlled style for their depiction of the mid century, a style exemplified by the work of Nicolas Poussin (1594-1665). This academism can also be found in the Dutch writings on art of this period, for instance in Karel van Mander's Schilder-Boeck (1604), Philips Angel's Lof der Schilder-konst (1642) and Samuel Hoogstraten's Inleyding tot de Hooge Schoole der Schilder-konst (1678). By the late 17th century only an artist such as Aert De Gelder (1645-1727) continued to work as what was called by then the old-fashioned style of Rembrandt. On the other hand, the academic artist and critic Gérard de Lairesse continued to promote the French academic taste illustrated then in the paintings of Adriaen van der Werff (1659-1722), called by Arnold Houbraken in his Groote Schouburgh der Nederlantsche konstshilders en schilderessen (Great Theatre of Netherlandish Painters and Paintresses) of 1721-23, the greatest of all Dutch painters. His paintings exhibit the idealised and classical grace of the late Dutch classicism. This trend extended well into the 19th century but declined rapidly in the second half of the 19th century. Kauffmann, C.M., Catalogue of Foreign Paintings, I. Before 1800. London: Victoria and Albert Museum, 1973, p. 148-9, cat. no. 176. W. E. Suida, Ringling Museum, catalogue of paintings, 1949, p. 237, no. 273, repr. Art in America, xxxii, 1944, p. 11, fig. 5.